Nestled along Fightingtown Creek in Blue Ridge, this rental puts you far from the noise and stress of the city. Enjoy hiking, fishing, and fresh mountain air alongside up to two dogs (for a small nightly fee). When the sun starts to set, head to the backyard and use the outdoor firepit for a bit of rustic ambiance. Whether you're looking to stretch your legs or enjoy some of the best trout fishing in Georgia, this dog-friendly cabin is perfectly placed for a relaxing mountain getaway. Treat your family to a peaceful atmosphere alongside perks like a private hot tub, free WiFi, and brand new mattresses in both bedrooms. Enjoy balmy evenings on the deck in the summertime or the warmth of the seasonal fireplace during colder months. Satellite TV and free WiFi let you stay entertained back inside. Meanwhile, the hot tub lets you soak your stress away outside. The country kitchen combines a welcoming, homey atmosphere with all the tools you need to make a delicious dinner. 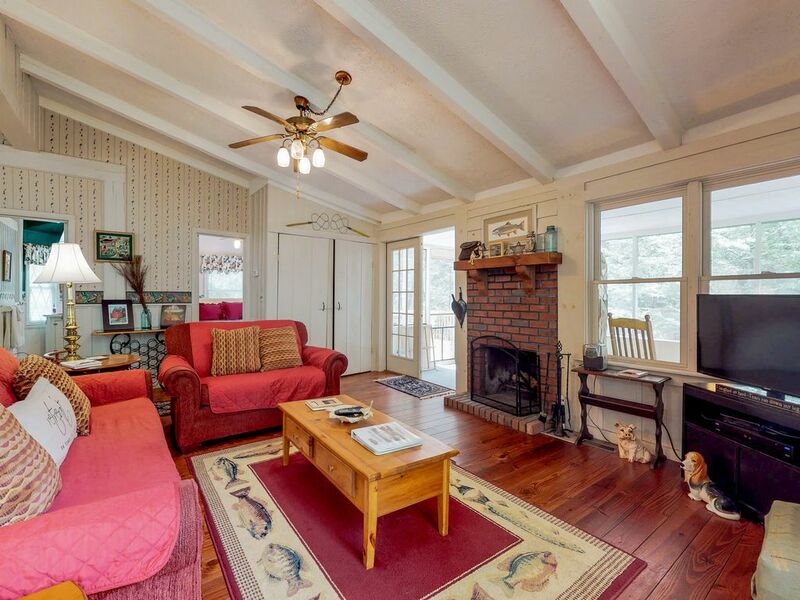 Experience the Blue Ridge mountains from the comfort of a lovely cabin. Save your dates today! Great little cabin by the river. Very private feel, pet friendly, and close enough to everything in Blue Ridge. Loved every minute of the stay. Plenty to explore. Blue Ridge is a beautiful friendly town, lots of hiking trails, wonderful scenery and quiet accommodations with a bubbling stream to make it even calmer. This cabin was close enough to town but also far enough away to be secluded. It had all the checkpoints we were looking for. Loved the real wood fireplace in the living room and the hot tub was perfect along with the weather. Beds were extremely comfortable! The pictures do not do this place any justice, it was perfect. Sherry, we are so glad you found the cabin perfect for your vacation! We look forward to hosting you again. Thank you! Such a lovely home. Very cozy, the fenced in front yard was great for the pups. Hot tub was so nice facing the river! What a wonderful experience. We will be back! Stayed here with the fiance' Jan 11-13 and it was great. I've read a lot of reviews about it needing updating and this and that...it's a cabin in the woods! It is perfect in my opinion. Only dislike I had was trees down the bank of the creek makes it difficult to fish....other than that no complaints from me.